Possibly late 1978 or sometime in ’79. 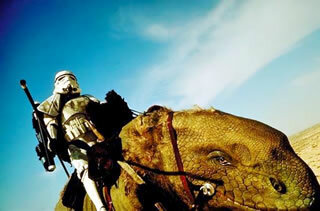 I do like this one of the stormtroopers in the desert. But to be honest, when I was 9 or 10, I just assumed that they were all robots or something. This made it all the more fascinating that Luke and Han donned their exoskeletons to break into the Death Star prison block. It wasn’t merely theWorld War II movie trick of donning an enemy uniform a la Richard Burton, but of pretending to be a robot! I was left wondering what the stripped robots looked like back at theMillennium Falcon. Quite clearly, I was proud of the panel at bottom-right; I signed it! “Whitey” or “White” with a flourish of the biro. In joiney-up writing an’ all. I wouldn’t surprised if this was the sort of thing my mate Niall F started doing on his drawings once we learnt handwriting in school. Interesting alternative spelling for the word ‘moisture‘. 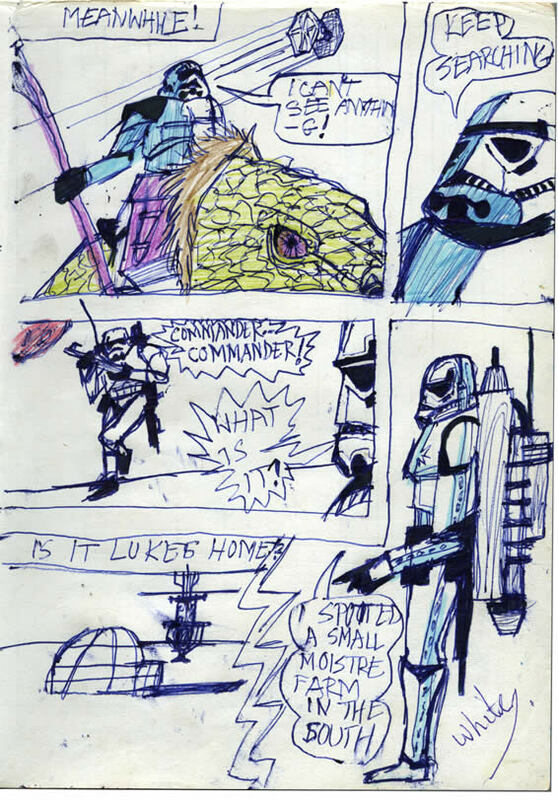 But, but… “Is it Luke’s home?” You’re seeing a genuine attempt at building suspense here folks! Used for the wraparound Star Wars comic cover poster! I loved this picture. I couldn’t ever remember seeing it in the film so maybe that made it even better. 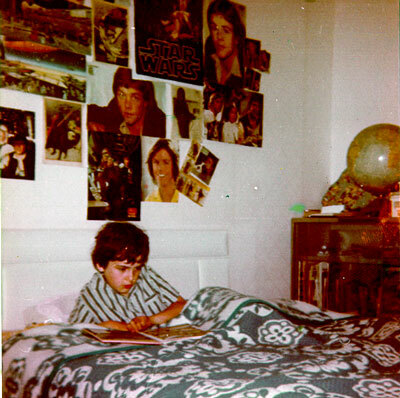 One evening, my dad arrived home from work having actually found a Star Wars Weekly comic in Eason’s, the big department store on O’Connell Street in Dublin city. You can’t imagine how buzzed I was to see this poster as the wrap-around cover! Surprisingly, I’d forgotten that they were named Dewbacks. Even more surprising is the fact that I removed the cherished cover, from the cherished comic and put it on the bedroom wall. You were supposed to do that with it but I was always very careful to look after my stuff. I’d be amazed watching some friends quickly reading-through a comic – taking in very little of the artwork – and then chucking it in the bin. After all, comics were for reading and re-reading over and over weren’t they? Eventually I would have envisaged reuniting the covers with my SW comics, but over 30+ plus years the covers have disappeared. They’d have been in a poor state from being on the walls until I got into heavy rock and replaced them; but they’d still make my old SW comics look less eviscerated now. Maybe they’ll all show up… in part of my mum and dad’s house. "I can't see a anything!" shouts the stormtrooper. Another Stormtrooper replies, "Keep searching." A stormtrooper runs towards us. "Commander... Commander!" he shouts. "What is it?" his superior replies. The stormtrooper points, and says, "I spotted a small moisture farm in the south."